To enter this exhibition, viewers walked through an almost uncomfortably narrow space between two of the artist's "paintings" that hung perpendicular to the walls just inside the gallery entrance. Large Yellow Lawnchair Webbing and Small Red Lawnchair Webbing (all works 1993) were made of the titular material woven around 2-inch deep stretchers. Szafranski placed them too close to the doors for one to get a good view of them before passing between them. Szafranski like to manipulate his audience, to let them know he's in charge. But compared with his last Dallas show, when he stood at the door extracting a $2 admission fee, this show began on a gracious note. 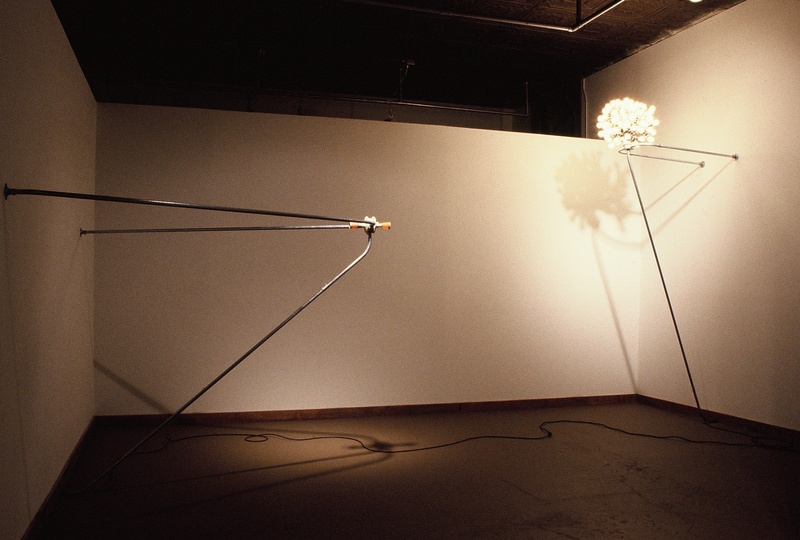 Szafranski has worked in materials ranging from playing dice to knotty-pine paneling to Christmas tree flocking, but his low-tech light sculptures tend to dominate his shows. This time there were two such pieces. Tall Illumination Device was a tangle of low-wattage bulbs set like some rare flower atop a 10-foot support of metal conduit. Extended Heat Lamp Device consisted of ceramic heating coils on a conduit construction low enough that viewers felt the considerable heat it generated. Both pieces transformed two of the basic elements of life, heat and light, into mildly threatening yet slightly comic forces. The bulk of the show consisted of pieces that fit as awkwardly into the "painting" category as the plastic webbing works. Ranging is size from a few inches to nearly 8 feet square, and for the most part hung traditionally flat on the walls, these works are woven from admission tickets, explosive strips for a cap gun (bang caps), and videotape. Their unobtrusive craftsmanship combines painstaking labor and the sort of simple pleasure one found in making potholders on grade school. Extra Large Four Color Tickets is an impenetrable wall of admission tickets. Small Red Bang Cap Strips was the ugly runt of the show, but it is literally waiting to explode. The most gorgeous piece was an enormous black square made of videotape. The teasing title is 24,000 Inches of Adult Video, but the salacious contents of the tapes can only be imagined: all that can be seen is one's own reflection in the glossy surface of the piece. A measure of these works' interest is the near-impossibility of speaking of them without using the inadvertent puns relating to the "interweaving of surface, support and content" or the "web of formal and narrative concerns." As delicate as the works must be, their woven surfaces appear to have a vigorous elasticity. Such a contradiction is central to Szafranski's interest in demonstrating the fragility of the conventions, social and artistic, that hold our several worlds together. Charles Dee Mitchell is a free-lance art critic in Dallas.